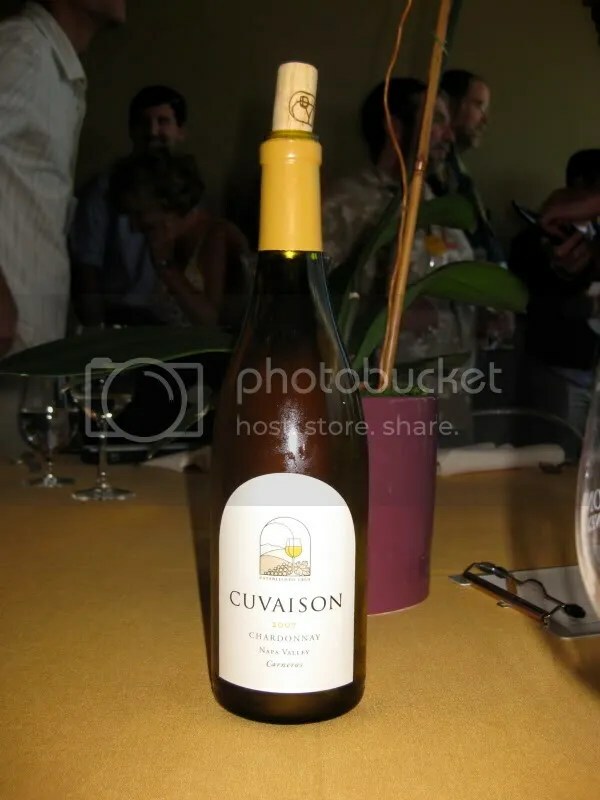 Prior to the Wine Blogger Conference, I had not heard of Cuvaison. That shouldn’t really come as a surprise as I’m not terribly familiar with many Napa wineries…I’m just dipping my toes into Napa in the last year. 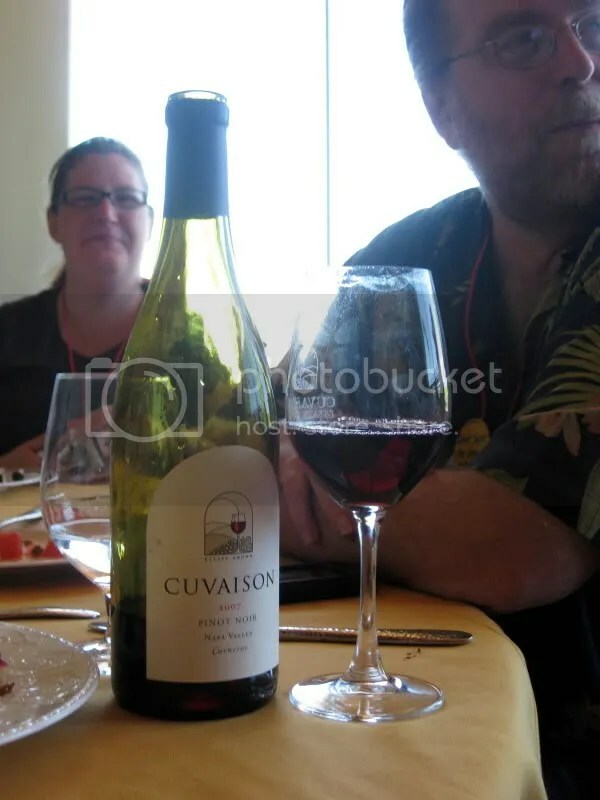 After we boarded our bus from the Culinary Institute of America, we were told we were headed to Cuvaison for lunch. 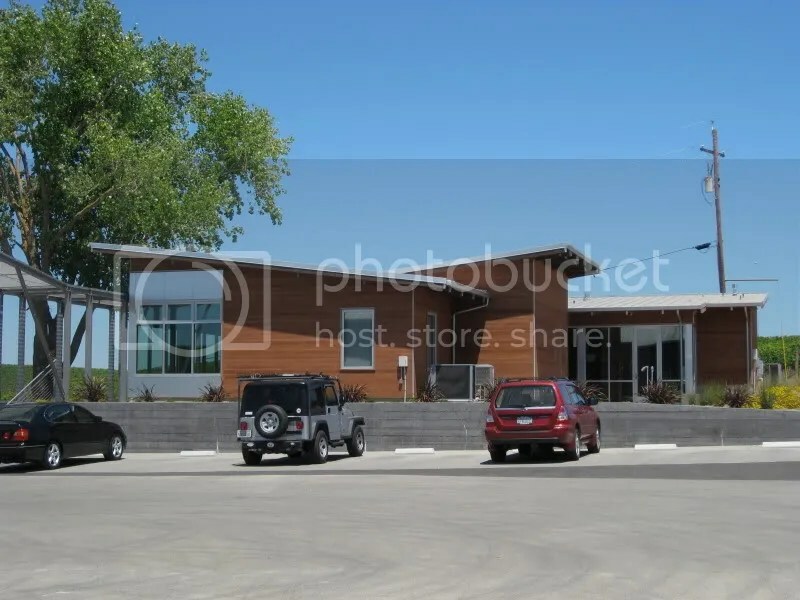 Unfortunately, a snafu with scheduling/directions/communications landed us at Cuvaison’s Calistoga tasting room when we were intended to be at the Carneros tasting room….40 some odd minutes away on the other side of Napa. Which I unhappily discovered being the first to run into the tasting room searching for a rest room. Now, happy go lucky wine bloggers that we are, we made the best of the delay and tried to quiet our rumbling tummies with wine and chatter and the occasional song. 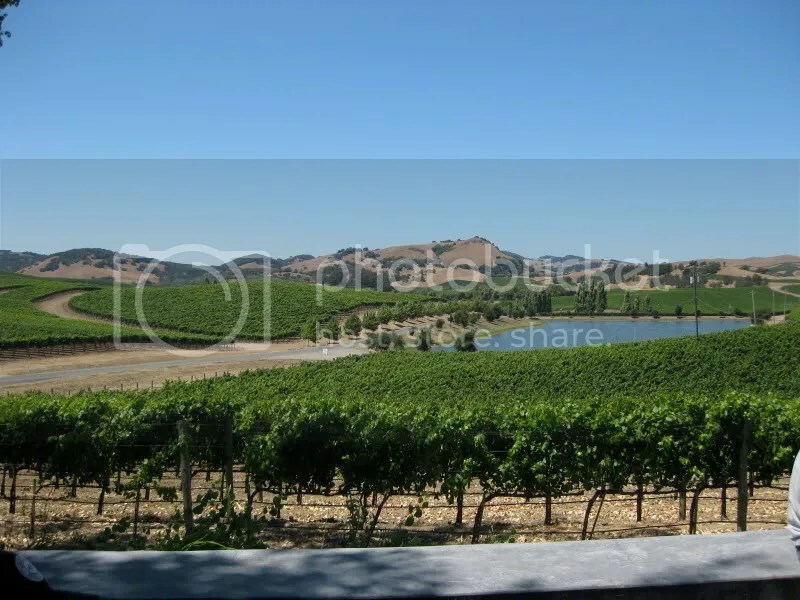 We eventually arrived at Cuvaison’s Carneros facility, a new tasting room for them, set among sweeping views of their vineyards. We were greeted with glasses of the 2008 Sauvignon Blanc as we stepped off the bus and quickly made our way to an upstairs meeting room where lunch awaited. While we lunched, the Cuvaison folks gave a presentation about Cuvaison’s green efforts and the history of the vineyard. 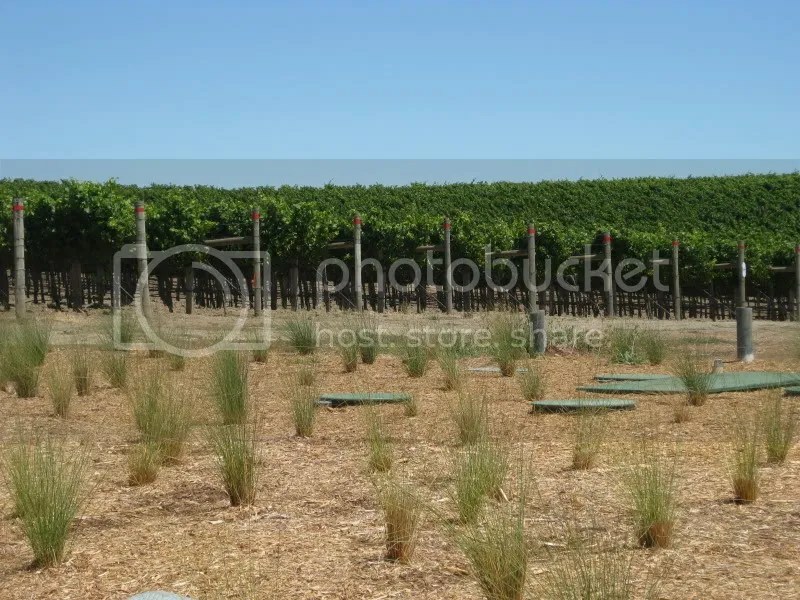 (Some folks noted it was amusing we got printed out handouts for the green presentation…) Cuvaison has been around for 40 years and produces about 60 thousand case of wine a year from the 280 acres they have under vine. We tasted through some of the current line up as we enjoyed lunch, and were each treated to a bottle of wine as a parting gift. I chose the Pinot Noir so I’ll have a more in depth post about that wine in the coming months. 2008 Carneros Sauvignon Blanc: $20. Grapefruit, grass, hay, green pepper, white pepper, cantaloupe, tart, crisp, light. Perfect after getting off the bus! 2007 Carneros Chardonnay: $22. Lemon butter, lemon, apple, spice, pear, round, lemon, pear butter, wood. Thea probably won't like this one. 2007 Carneros Pinot Noir: $32. Raspberry, strawberry, full red fruit, little earth, cedar, red currants, pepper, tart red fruit, great acidity, red berries, little cream on the nose. 2006 Mount Veeder Cabernet Sauvignon: $45. Black cherry, pepper, green pepper, blackberry, spice, dark red berries, tannic, chewy, black finish, drying. Really young. 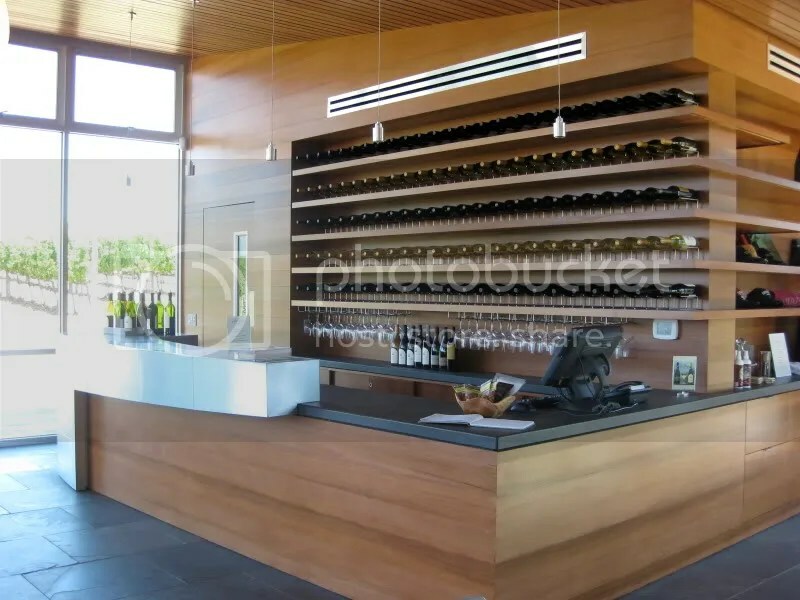 Carneros tasting room. Not Calistoga. Overall, a solid line up. I was sad to have our time at Cuvaison cut short. I would have liked the full tour we were supposed to get, and I would have liked to have taken a few more notes on their practices, but I was extremely hungry and really needed to eat rather than put pen to pad. 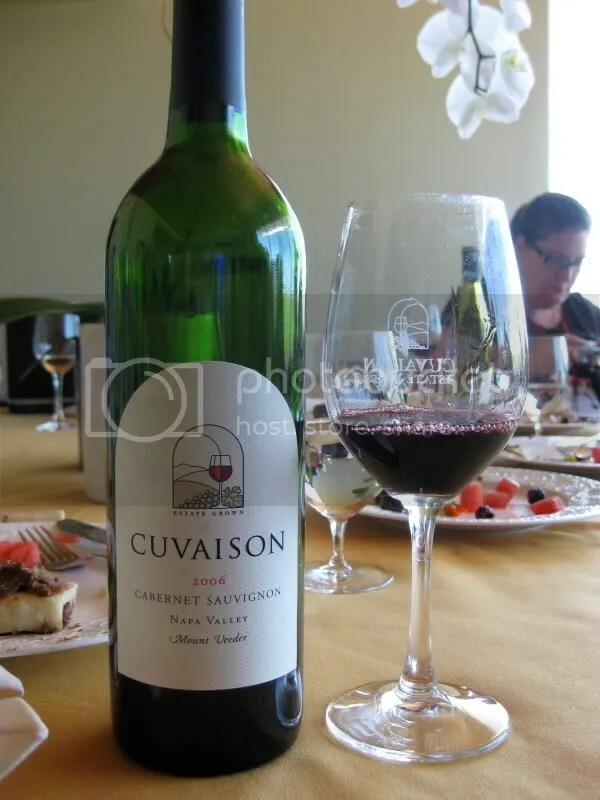 However, many of Cuvaison’s practices are outlined on their website and blog, so I suggest you check that out. *As you can probably tell, I’m finally getting around to my posts from my last trip to California. I try. Sorry for the delay.